Kali Besar Festival in West Jakarta, Be There! The Kali Besar Festival at Jembatan Budaya, Kota Tua area, Taman Sari is held to entertain tourists in West Jakarta, Thursday (8/30) afternoon.
" 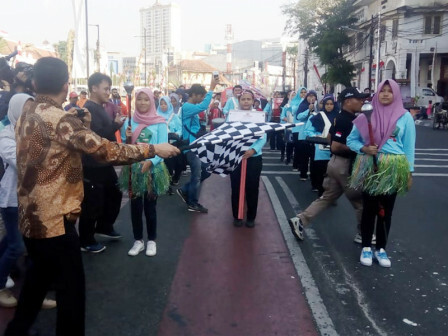 It is hoped able to entertain the tourists, including attracting the attention of Asian Games participants"
The festival that opened by West Jakarta Acting Mayor, M Zen was started by a carnival from a number of cultural arts and ontel bicycles communities. "It is hoped able to entertain the tourists, including attracting the attention of Asian Games participants," he stated. After Kota Tua revitalization is finished and opened, the Kali Besar area can attract the attention of the tourists. "Foreign and domestic tourists flock to take photos at Jembatan Budaya or enjoy views of the floating and water parks that have been filtered," he told. West Jakarta Tourism and Culture Sub-dept. Head, Linda Enriany explained that the festival is aimed to welcome the Independence Day and commemorate the history of Kali Besar, as well as introducing new tourist destinations to tourists. "In the past, Jakarta that is known as Batavia, became a trade center and a collection of spices by passing the service route in Kali Besar. This is an attraction for local and foreign tourists visiting the Kota Tua area. As a new tourist destination in West Jakarta, the Kali Besar area has an attraction in the form of floating park and clean water flow. "It's surely able to attract the local and foreign tourists," he said.